How would we call this monstrosity?, ¿Tyrannocephalosaurus Rex or Pachycephalotyrannus? 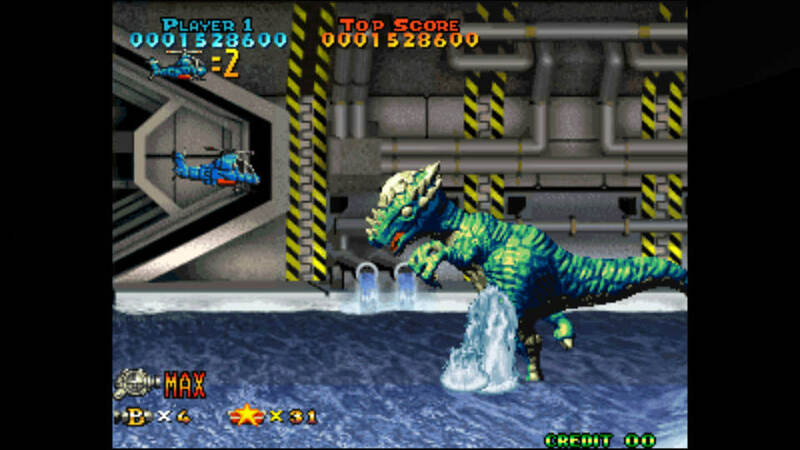 ¿Are you back from Jurassic World Fallen Kingdom?, then get on your console 'cos there's "Dino-mayhem" in the ACA Neogeo as another shooter hits the collection, and is no other than Prehistoric Isle 2, the sequel of SNK's Prehistoric Isle in 1930. Unlike the prequel which was made by SNK, the sequel was a joint-project developed by SNK, Yumekobo (Blazing Star) and Saurus (Shock Troopers & Shock Troopers 2nd Squad). The story doesn't explain too much in the intro. But if you've played Prehistoric Isle in 1930 you'll have an idea: After the discovery of surviving and mutated prehistoric lifeforms in Greenhell Isle as the cause of the mysterious shipwrecks and plane disappearings near Bahama, the expedition was attacked by a flock of Pteranodons, which resulted in their deaths becoming the next victims of Greenhell Isle, which became a part of the mystery of the Bermuda Triangle. 69 Years later, as human history is about to turn the page of the new millenium, the mainland is attacked by a swarm of dinosaurs. Prehistoric chaos goes rampant in North America. Fortunately, the military and its technology has evolved after the 30's and they send their best gunship helicopters to bring the dinosaurs back to extinction, unleash a "Leave-No-Dinosaurs" assault to Greenhell Isle and bring the prehistoric nightmare to an end. But this time they'll be facing not just the dinosaurs, but also the supernatural being who brought them back. McDonnell Douglas / Hughes Helicopters / Boeing AH-64 Longbow Apache: This is the Full frontal-type helicopter, it's initial configuration is the "Cannon" (Blue "C" item) which is a stream of blue bullets that passes through the enemies. Holding the fire button releases a diagonal shot that can be aimed either up or down. It's Bomb is a frontal blast of waving fireballs. Player 1 controls a blue Apache, while Player 2 is a yellow one. Mil Helicopters / Russian Helicopters Mi-25 Hind-D: The "Spread Shot" type helicopter. It's default weapon is the "Gun" (Red "G" item) which fires a curtain of bullets. Holding the fire button will release a frontal shot that can be spreaded by moving the ship. The Hind-D's special weapon is a 5-Way Blast of green fireballs. Player 1 takes command of a green one while Player 2 controls a red helicopter. Like in Blazing Star, both players can pick the same ship. The only difference is that Player 1 has male pilots and Player 2 gets the girls. Unfortunately there's no "Alternate Third Color" feature like in Blazing Star where pressing C+D buttons unlocked a third alternate color. Like its predecessor, the game is your horizontal shooter where the objective is to eliminate all the hostile dinosaurs, yeah, even grasseaters like the Protoceratops and the Parasaurolophus want humanity extinct. So that's what your helicopter is for, take the dino-freaks down. If we compare Prehistoric Isle 2 with Prehistoric Isle in 1930, we will notice the lack of the rotating R-Type like pod and its special weapons, leaving you with the C-Shot, G-Shot and the basic three variety of missiles: The Napalm (N-Missle) which is the bomb projectile that leaves a flame upon impact, the Homing (H-Missile) which follows your enemies, and the standard Missile (M-Missile) which unlike the basic linear projectile, it fires a 3 way missile shot. There's an extra missile, the Special/Super Missile (S-Missile) which is a fast twin missile shot of incredible power. To obtain it, you have to survive the stage until the end of the second activity without dying once. If you die while having the S-Missile you'll lose it. One of the things that made Blazing Star very addictive was the combo/multiplier thing via charge shots. In Prehistoric Isle 2, the multiplier mechanic was changed to a "Bonus Time" that can be triggered everytime you pick a weapon power-up when your power level is at its maximum, that's where you can rack up a higher score value from your enemies. Another nerfed Blazing Star thing was the bonus items. Picking more of them increased their value, encouraging the player to don't let one go. In Prehistoric Isle 2, the bonus items work in a similar way, but they don't give you the mindblowing amounts of points. Life finds a way...to create havoc on humanity. However there's two activities to do during most of the stages. The first one is "Defend People", which the objective consists on killing all the dinosaurs trying to devour the helpless victims as they hop on the helicopter for their own safety. As the onboard survivor counter increases, you'll get power ups for your helicopter and even a Turrican-like bomb that clears the screen. Although the total number is reached, there'll be unlucky survivors that you'll have to let them climb on your helicopter until you'll reach the second (and much easier) activity, where they'll jump to another rescue helicopter. All these activities give you bonus points and power-ups. Also, surviving without losing a life is another bonus, tagged in the results screen as Challenge Star Bonus, and what's best, this bonus can be increased as long as you stay alive. Like all the entries in the ACA Neogeo series, the game offers four options. All of them with their respective score achievements with a total of 12 available achievements waiting to be obtained. ORIGINAL MODE (Japanese Version): Play the japanese version of the game, which is called Prehistoric Isle 2 Gen-Shi-Tou. ORIGINAL MODE (English Version): Play the USA/Europe english Prehistoric Isle 2 localization. HI-SCORE MODE: Reach the highest score possible with 3 lives and no continues. You can submit your score to the leaderboards. CARAVAN MODE: Reach the highest score possible in 5 minutes on pure Star Soldier style. Graphically, the game aims to the Pre-rendered 3D graphics, something that Yumekobo knows very well since their Aicom days of Pulstar and their previous work, Blazing Star. The character design is pretty much of a mix of everything. Starting off with your vehicle which looks like a "Chibi" version of an AH-64 and Mi-25 , which look more Metal Slug-like vehicles rather than the Pulstar/Blazing Star-esque CG-style machinery. Unlike the previous Prehistoric Isle, the dinosaurs are depicted in a more accurate way (from the 90's perspective prior to the modern feathered dinosaurs). For instance, the Stegosaurus is no longer a horn-headed dinosaur, there's a larger variety of species featuring the Velociraptor, Protoceratops, Triceratops, Parasaurolophus, more Pterosaur species like the Dimorphodon, and also some original creatures like the Pachycephalosaurus/Tyrannosaurus hybrid from the first stage. There's also mutant insects and even a humanoid Ceratosaurus-like Kaiju that enlarges the cast of dinosaurs in this game, all of them as pre-rendered models which makes them more "realistic" and fit way better in the game's scenery and background than the player ships. As for the pilot design, Yumekobo took a step back on the pilots as they dropped the fan-favorite Anime style that we saw on Blazing Star in favor of more "realistic-looking" characters. A difference between the english and japanese versions is that the US/Euro version is "censored". The japanese version has dinosaurs dying in puddles of blood and Stage 4 has a Diplodocus being devoured alive by flesh-eating larvae, the english version has those things removed. The sound department is another twist. Unlike Blazing Star's use of electronic ambient beats, Prehistoric Isle 2 goes for a more "orchestral" style music that fits on the rampant dino-chaos unleashed on the world. While the music sounds fitting on the game, it becomes quite forgettable. The dinosaur sound effects are a vast improvement from the use of Godzilla/Kaiju roars from the first Prehistoric Isle, making the hissing and roaring of the prehistoric beasts more fitting than before. - This is the last shooter developed on the MVS hardware. - Prehistoric Isle 2 is the last shmup developed by Yumekobo, and its lone entry in the Giga Power Pro-Gear Spec hardware. - It is also the lone joint project between SNK, Yumekobo and Saurus. 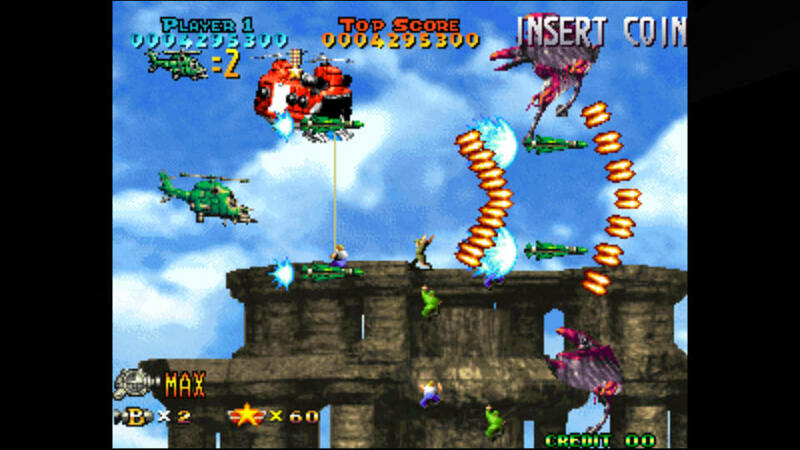 - Prehistoric Isle 2 is also the penultimate shmup released on the Neo-Geo. - This is the lone entry on the series without a submarine stage. - It is also the only entry in the series where cavemen are absent. - Like in Prehistoric Isle in 1930, dinosaurs explode when they die. - The Greek-like temples and Mayan pyramids in stage 2 could be a reference to the Atlantis myth as the origin of all civilizations as they left and scattered across the continents when Atlantis sank into the ocean, sharing similarities with each other. - Atlantis is also related with the mystery of the Bermuda Triangle. - The Stage 2 Boss ground punching attack might be a Fatal Fury / King of Fighters reference. Terry Bogard's Power Wave and Power Geyser moves to be exact. - The Hi-Score Mode seems to be a mix between the English and Japanese versions, since the title screen is the english localization, while the game is the uncensored japanese version. - The player's death explosion animation was recycled. - The fireball sprites of the AH-64 bomb attack look very similar to those of the Windina's 3 Way Spread Charge Shot. As your typical Yumekobo shooter you know what to expect: Colorful 3D-like graphics and non-stoop shooting action, but in my personal opinion better stay with Blazing Star unless you want to blast some dinosaurs out of existence. Prehistoric Isle 2 is a decent shooter, but it lacks replay value when its compared with Blazing Star, making Prehistoric Isle 2's gameplay a little bit "extinct".